When I became a teacher years ago, I promised myself that I would be a lifelong learner, always striving to incorporate this knowledge into my teaching. I also promised myself and my students that I would reflect on how I chose to teach. I reflect on daily lessons as well as monthly and even yearly to assess what works and what doesn’t when it comes to providing the children of this parish an excellent education. This past year I enrolled in a certificate program from the Vibrant Faith Institute. 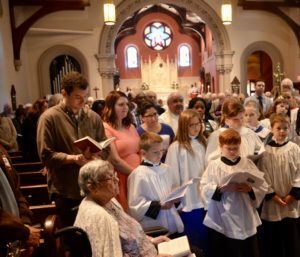 I am fortunate that Father Adam and the Central Pennsylvania Episcopal Diocese has offered me the opportunity to learn about Faith Formation from birth through all the seasons of adulthood. This has helped me decide how we provide formation to our parish. This September we are offering all of our education on Sunday mornings. It will be such a blessing for all members of our parish to worship, learn, and then have fellowship together. Intergenerational learning and worshipping together is what studies are showing help keep children and youth in a relationship with God and the church. This, in addition to parents transmitting their faith to their children, is how they grow in their faith. This means equipping parents and children with the tools to worship, learning about their faith both in and out of church, and being in relationship with others in the community. St. John’s created milestones that focus on learning and worshipping together. Some questions we asked are: With what tools do we want to equip parents so they can carry faith education into the home? How do we know what to teach and when? How do we know when we have accomplished these goals? These milestones have objectives for worship, formation, service, and fellowship. We tried to make it as comprehensive as possible. Because church is a place of choice, and people come at various times, it is a guide for what we want to accomplish when families come through our door. We have to pair our goals and objectives with families and their relationship with God and what they want for their children. The milestones we created also help all ages develop as they worship. Many of these milestones give church staff, parents, and the rest of the church community an idea of where the children are developmentally. For example, our four year olds will be welcomed into Sunday worship. Many of our younger members spend most of their time in the nursery. We want to celebrate when they start worshipping in the sanctuary with their families on Sunday mornings. It offers excitement and energy to the church. First graders will have a goal of learning the Lord’s Prayer. Giving them a space where they are really good at a part of the service helps them feel confident and part of the community. We will let them lead the prayer one Sunday morning. Our middle schoolers will really dig deep into the Nicene Creed, by not only memorizing, but really discussing what each part means so when they are praying this prayer weekly they can better connect to it. Finally, we are hoping to build not only a solid foundation in worship and education but in fellowship. Relationship is so important in building lifelong Christians. Starting at home and building a relationship around growing faith is essential. We will help parents and families move in this direction as they need it. We will empower and approach families that have this experience to share with our community. Parents will be equipped weekly with questions and conversation starters to help make further connections outside of the church building. Having a snack and fellowship for the children between worship and formation is essential in building relationships with peers who are growing in the same faith. We are also hoping to have prayer partners between people in the church who wouldn’t necessarily meet on a regular Sunday. You will begin to see the way we are intentionally building relationships between peers, teachers, and then the greater church community. I look forward to engaging with the kids, parents, and the rest of our church as we all learn and grow in our relationship with Jesus Christ. Many of the resources I mentioned, such as the milestones and curriculum, will be available for you to read. I always look forward to answering questions and conversing about educating young minds and hearts; please don’t hesitate to contact me with any questions or comments!